Agate /ˈæɡət/ is a rock consisting primarily of cryptocrystalline silica, chiefly chalcedony, alternating with micro-granular quartz. It is characterized by its fineness of grain and variety of color. Although agates may be found in various kinds of host rock, they are classically associated with volcanic rocks and can be common in certain metamorphic rocks. Most agates occur as nodules in volcanic rocks or ancient lavas in former cavities produced by volatiles in the original molten mass which were then filled wholly or partially by siliceous matter deposited in regular layers upon the walls. Often you will see geodes forming inside the agate. Agate has also been known to fill veins or cracks in volcanic or altered rock underlain by granitic intrusive masses. Agates when cut transversely exhibit a succession of parallel lines. Often of extreme tenuity gives a banded appearance to the section of agate. Such stones are known as banded agate riband agate and striped agate. Here is the list of agate books with my affiliate links to amazon. Lets start with my favorite agate book. This is one of my favorite agate books because it really explains how agates formed. It also has wonderful photography and illustrations. The definitive book on Lake Superior’s agates is here. If you’re a casual rock collector, you will find Agates of Lake Superior fun, interesting and beautiful. If you’re a more advanced hobbyist, you will appreciate this professional and scientific resource. 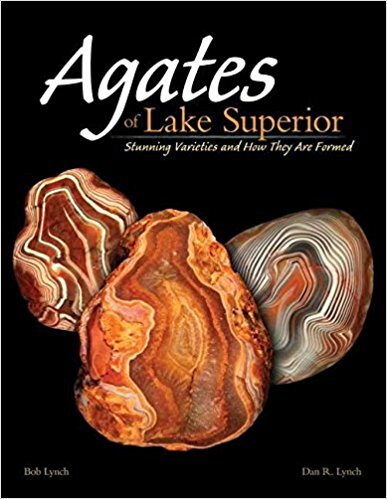 The book provides a thorough examination of Lake Superior’s strange and unique agate varieties, as well as a critical look at agate formation theories, tips on how to find and identify agates, where to look for them and how collectible your agates may be. A great guidebook featuring full-color photos of hundreds of rocks and gems for collectors and enthusiasts, created in collaboration with the Smithsonian Institution and written by a geologist with decades of experience. Author Ronald Bonewitz started his career as a geologist specializing in crystal chemistry, worked as a mining scout in the field, and now serves as a gem, mineral, fossil, and antiquities expert at an auction houses. Rock and Gem combines his knowledge with hundreds of stunning photos from the Smithsonian’s extensive collections, making professional-level knowledge accessible to readers of all experience levels. In addition to resources on each of several hundred individual rock and gem types, the book contains a compelling history of how rocks are formed, starting with the Big Bang up to the present day. It also includes a guide to starting your own collection as well as several fascinating feature boxes exploring topics like the Malachite Room in the Winter Palace and the superstitions surrounding the world-famous (or infamous) Hope Diamond. Whether you’re a collector, a student, or just someone interested in discovering the beauty and intrigue of gems and other fascinating rocks, Rock and Gem covers its fascinating subject matter from every angle. Become a whiz at finding Lake Superior agates. Learn the common features to look for. See what rough agates look like in the field. Recognize the different varieties of Lake Superior agates. And identify the agate imposters that might fool you. This guide easily tucks into your pocket and will quickly become an essential tool when you’re out in the field. You’ll learn to pick up on those clues valuable to beginners and experts alike, turning your agate hunts into successful ones. If you are interested in finding more than just agates on your rock hound hunts check out this book. Jaspers are my favorite type of gemstones. They come in hundreds of different colors and patterns. This book with help you learn about jaspers of North America. From the author of Collecting Rocks, Gems and Minerals and one of the leading agate collectors in the world, comes this comprehensive guide to collecting agates and jaspers, the most sought after types of collectible rocks on the market today. Designed with all beginners in mind, yet filled with valuable technical information for advanced enthusiasts, Collecting Agates and Jaspers helps rockhounds discover these treasures of North America. The only book on agates and jaspers to offer values. Featuring nearly 700 beautiful color pictures, descriptions and technical information, the book provides an easy-to-use, quick reference format perfect for home and field. Organized by U.S. states and provinces in Canada and Mexico, with introductions pinpointing each area’s best spots and what you can find there. This book has been very well received as the first popular guide to these brilliantly banded and highly prized gemstones. The agate is one of the world’s most strikingly beautiful semiprecious gems. Collectors worldwide are drawn to the stone’s infinite variety of coloration and banding. While these stones are readily available, the rare and higher-quality ones are quite valuable and aggressively collected. Agates is a comprehensive reference written by one of North America’s leading experts in cooperation with the Natural History Museum of London. The book features an easy-to-use identification guide and a worldwide listing of where agates are found. More than 200 color photographs of superb agate specimens were selected from the extensive collection of the Natural History Museum of London and from the private collection of author Roger Pabian. Agates Inside Out is a wonderful book that introduces you to the world of agates. What are they? How do they form? What mysteries do their colorful patterns reveal? Where to look for them? What types of agates can be found there? Many great photos, charts and diagrams. Written so anyone with an interest can learn. You’ve admired agates for their color and beauty—now learn how to find your own. Unlike other books, Agate Hunting Made Easy provides step-by-step instructions to help you turn those once-frustrating agate hunts into successful ones. You’ll have an experienced collector, Jim Magnuson, as your guide: He will show you photographs by Carol Wood of what rough agates really look like in the field. His tips will help you recognize agate imposters that often fool inexperienced collectors. He will teach you how to hunt in a variety of locations, from gravel pits to lakeshore. Plus, Jim also provides a rating scale to help you estimate the value of your finds. This book is just what you need to help make agate hunting easy. If you are interested at seeing some very interesting agates this book is for you. Lake Superior Agates are world renowned for their unique, translucent beauty – but no one’s ever seen them quite like James Magnuson and Carol Wood. The authors highlight the celebrated stone with lighthearted stories and an amazing collection of natural, artistic photographs. Whether you’ve never seen an agate or are an avid agate hunter, this new look at Lake Superior Agates is bound to stir your interest. Here is another great book by James Magnuson and Carol Wood. Fairburn Agates are beautiful, banded gemstones found primarily in South Dakota’s Black Hills and also in parts of Nebraska and Wyoming. They are world renowned for their unique, translucent beauty, but no one’s ever seen them quite like James Magnuson and Carol Wood. The authors highlight the South Dakota State Gem with lighthearted stories and an amazing collection of natural, artistic photographs.Whether you’ve never seen an agate or are an avid agate hunter, this new look at Fairburn Agates is bound to stir your interest. Agates – few other natural formations exhibit the tremendous variety seen in these curiously banded gemstones; no two are exactly alike when it comes to color, pattern or shape. And though they are found on every continent, many well-known and significant varieties are present in North America. This book features more than 60 of the most famous, most valuable and rarest agates from Canada, the United States and Mexico. Intriguing, informative text explains the fascinating differences between agates, while compelling, true-to-life photos show each agate’s special beauty. In this book two renowned experts share their lifelong passion for geodes and their extensive knowledge of world-class geode deposits as they present the latest theories on the formation and occurrence of these amazing mineral gifts of nature. Visit the geode mines of Northern Mexico and Southern Brazil with Brad Cross. Learn the geode mining process and how the astonishing treasures hidden inside are uncovered. Travel with June Culp Zeitner as she explores vast geode deposits throughout the Midwestern U.S. that provide a recorded history of the ancient seas that once covered the land. Discover Florida’s ocean harvest of unparalleled agatized geodes. Meet the close cousins of geodes—thunder eggs, septarians and concretions. See over 140 full-color photos of geodes that defy description! Next post: How to Fuse Gold – Knowing this technique will change everything! No solder needed!